Tony Blair visits a United Nations run school sheltering Palestinians, whose homes were destroyed during last summer’s Israel’s war on Gaza City, Feb. 15, 2015. GAZA STRIP — On Feb. 15, Tony Blair arrived in Gaza with an ultimatum. He traveled not on his own behalf, as a disgraced former head of government potentially facing war crimes charges over his role in the 2003 invasion of Iraq, but as the special envoy of the Middle East Quartet. The Quartet is a group composed the United States, European Union, United Nations, and Russia. It was established in 2002 to mediate the peace process in the Israeli-Palestinian conflict. During his brief visit, which lasted only hours, Blair reportedly found the time to demand that the Hamas movement amend not only its policies within Palestinian governance, but also its own agenda as a political party. “Blair says that there is no reconstruction unless these five conditions are fulfilled,” Hamas leader Mouza Abu Marzouk wrote on his Facebook page on Feb. 17, before listing Blair’s demands that the group accept a reconciliation agreement with its Fatah counterpart, base its political program on a Palestinian state within the pre-1967 borders, emphasize its nature as a Palestinian movement and renounce any “Islamist” affiliation or regional goals, accept a two-state solution as a final outcome, and coordinate anti-terror efforts in the Sinai with the Egyptian government. The Office of the Quartet Representative appeared to confirm Marzouk’s account through a Feb. 15 statement. In it, Blair called for “a unified Palestinian politics on a basis that explicitly is in favour of peace and two states, meaning a sovereign State of Palestine and a secure, accepted State of Israel” as a “pre-condition to a successful peace process,” before outlining the demands listed by Marzouk. Tony Blair, right, speaks with Palestinians during his visit to a United Nations run school sheltering Palestinians, whose homes were destroyed during last summer’s Israel’s war on Gaza, Sunday, Feb. 15, 2015. Blair’s ultimatum came during an escalation in Israel’s own economic war against Palestinians. Only a day after Palestinian delegates submitted their application for membership in the International Criminal Court, Israel announced on Jan. 3 that it had withheld the monthly revenues it owed to the Palestinian Authority. This clear breach of Israel’s obligations under the Paris Protocol on Economic Relations, which governs its collection and transfer of Palestinian taxes, has now entered its third month. The monthly shortfall of around $127 million, over two-thirds of the PA’s domestic revenue, has devastated the Palestinian economy, which relies heavily on its payroll. In January, the PA cut the salaries of its 180,000 employees by 40 percent. Last month, it borrowed from local banks, hiking its deficit to meet about 60 percent of its normal payroll of around $200 million, which includes $120 million from the seized taxes. Palestinians under Israel’s occupation are forced to rely on the Israel Electric Corporation to supply their power. On Feb. 23, after nearly two months of withheld revenue pushed the PA’s already staggering debt to the IEC near $500 million, the state-owned monopoly retaliated by cutting power to over 70,000 Palestinians in Nablus and Jenin for roughly an hour as a severe winter storm gripped the region. “Customers who do not pay electric bills are disconnected; yet here we have an entire population that doesn’t pay while we continue to supply electricity,” IEC Director Yiftah Ron-Tal said at a Jerusalem press conference, seemingly oblivious to his government’s attempt to crash the Palestinian economy. The IEC again cut power to much of the West Bank on Feb. 25 before agreeing to end its blackouts, in exchange for a share of the Palestinian taxes seized by Israel. When Israel announced that it would be freezing the PA’s tax payments, Palestinian leaders quickly denounced the move. “This decision is a new Israeli war crime, but we won’t back off in the face of those pressures,” Saeb Erakat, chief negotiator of the Palestine Liberation Organization, told the AFP on Jan. 3. But Shtayyeh also noted that the international community would probably not allow the PA, which secures Palestinian-administered areas of the Israeli-occupied West Bank, to collapse. “Netanyahu exploits the issue of Palestinian tax revenues for his political campaign, and Israel exercises collective punishment in order to lower the ceiling of Palestinian political demands,” he told Istanbul’s Anadolu Agency on Feb. 22. Ahmed Tanira 32, carries his child next to his wife Riham, as they walk in the rubble of Zafer 4 Tower, which was destroyed in the last summer’s Israel-Hamas war, during cornerstone ceremony for rebuilding Zafer 4 Tower in Gaza, in the northern Gaza Strip, Wednesday, Feb. 18, 2015. The international community seems eager to end the episode, at least according to its public statements. “We’re opposed to any actions that raise tensions, and obviously, this is one that raises tensions,” U.S. State Department spokesperson Jen Psaki told a press briefing on Jan. 5. Yet these same powers apparently back Blair’s threats to block the reconstruction of Gaza, which come at a time of dire need in the besieged enclave. Israel’s summer bombardment of Gaza not only killed over 2,200 Palestinians, including more than 500 children, but also destroyed around 96,000 homes. Another 10,000 people still live in 15 U.N. shelters, despite freezing temperatures and a series of harsh storms. Electricity outages, unusual in Jenin and Nablus, average 18 hours a day in Gaza. Under tight Israeli restrictions on imports, essential supplies like cooking and heating gas are scarce. In recent weeks, four infants have died of hypothermia. Another died from a shelter fire on Feb. 16. Israeli troops continue to fire on Palestinian farmers and fishermen at the bloody frontlines of the siege, violating an Aug. 26 cease-fire and stoking fears of a new military operation. A elderly man walks past a building which was damaged in last summer’s war, in the Shijaiyah neighborhood of Gaza City, northern Gaza Strip, Feb. 23, 2015. Israel previously froze payments it owed the PA after Palestinians won an overwhelming vote for their admission to the U.N. as a non-member observer state in 2012, with few consequences other than mild criticism from world powers. The Quartet, however, has not previously made such public threats against a civilian population, especially concerning the platform of a single political party. According to the Palestine Trade Center, only 1,661 truckloads of essential construction materials have entered the Gaza Strip since the August ceasefire. “This is less than 0.25 percent of the 800,000 truckloads that the Shelter Cluster estimates is required to meet Gaza’s housing needs,” Oxfam International said in a bulletin last week. 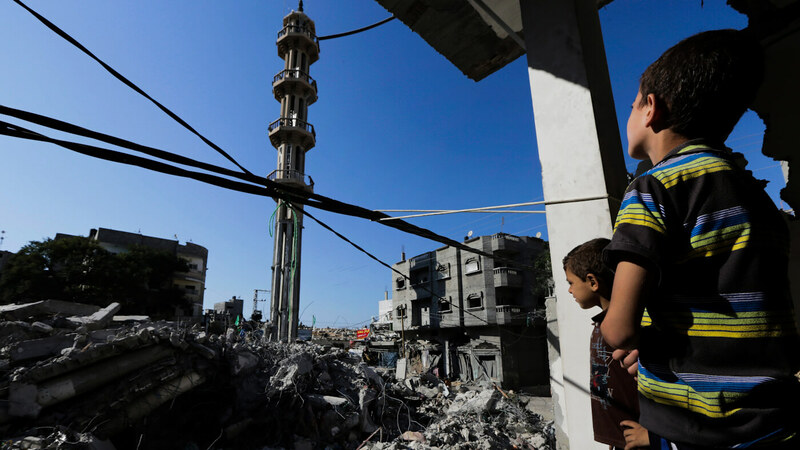 Relief agencies have received slightly over 5 percent of the donations promised by world governments at a conference held in Cairo last October to raise funds for the reconstruction of Gaza. With the cataclysmic condition of the Gaza Strip aggravated by the punitive measures of both Israel and the Quartet, and Israel’s financial strangulation of the PA decimating what remains of a Palestinian economy, those living under occupation see few signs of change.